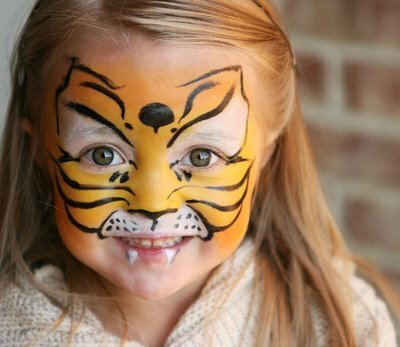 A safe and Healthy Halloween with DIY Face paints!! If there’s one thing you choose to do this Halloween, I urge you to reconsider using store-bought face paints and hair coloring for your child. I was shocked (not sure why considering the ridiculous loosey-goosey regulations in cosmetics), to find out how horribly toxic so many of these “traditional” Halloween products are. And we put them on our KIDS??? The Campaign for Safe Cosmetics, a national coalition of nonprofit health and environmental groups, were bravely determined to call these companies out and spread the word that they pose serious health dangers to anyone who might use them. The Campaign sent 10 popular children‘s face paints to an independent lab to be tested for a range of harmful metals. Horrifically, all of the products tested were contaminated with low levels of lead (no level of lead is acceptable or safe!! ), which can harm children’s developing brains. “Six of the products were contaminated with nickel, cobalt and/or chromium which can cause lifelong skin problems. Many of the products contained two, three or even all four of these metals. Due to the lack of cosmetic industry regulation in the United States, face paint, hair color and other products on U.S. shelves contain dangerous heavy metals and toxic substances that are banned or restricted in other countries. Disturbingly, parents have no way of knowing what’s really in these products just by reading the labels” (Safe Cosmetics). Six out of 10 face paints tested contained known skin allergens nickel, cobalt and/ or chromium – at levels far exceeding the recommendations of industry studies. Related What Should You Do When Your Child Sustains an Injury? Labels contained misleading claims, such as “hypoallergenic,” on products with known skin allergens. Hair colors and other cosmetic products contained hazardous chemicals that are banned or restricted in Europe, Canada and Japan and contained colors not approved for use in cosmetics by the FDA. These tests show us that our children are being exposed to potentially dangerous levels of heavy metals from face paints and other traditionally used Halloween products, some of which claim to be “safe,” “non-toxic” or “hypoallergenic.” These results further indicate that the FDA is not ensuring that face paints and other cosmetics are safe, and it is not taking the necessary steps to protect the most vulnerable – our children” (Thank you Safe Cosmetics for this useful information). 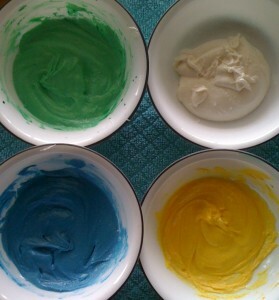 Here is a great recipe on how to make your own safe and natural face paints – you can find more recipes including hair spray, hair gel and Face Paints Made with Food – at the SafeCosmetics DIY recipes page!! Have a safe and healthy Halloween!! Wordless Wednesday | Tis The Season!